Can you believe it’s already May?! Summer is at our doorsteps, and we are riled up for some fun in the sun! This month is all about getting ready for warm days and long weekends. 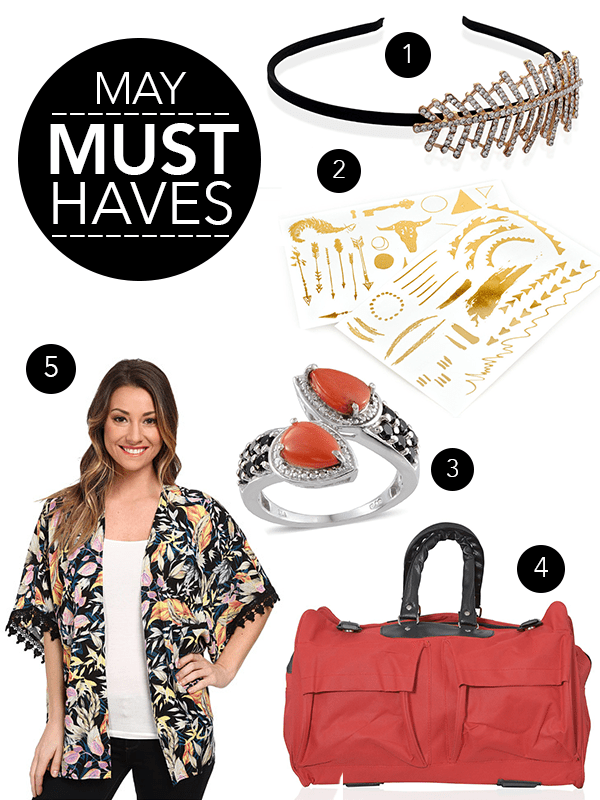 Check out our must-haves list for May, so you can be on your A-game this season. Keep your locks out of your face in the summertime with this stylish headband. Its petite form welcomes a feather applique with multi color Austrian crystals in goldtone. With festival season on the horizon, get ready to see your favorite celebrities rocking the latest trend–temporary tattoos. Often seen in metallic colors, these accessories are more popular than ever. These temporary tattoos are extra fantastic because they last longer than most others. Try them out for yourself! It might still be a little too chilly outside to dive head first into the ocean (or a pool for that matter), but this gorgeous Mediterranean coral ring will have you feeling close to the sea. Embellished with Thai Black spinel, this elegant ring is crafted in an intricate design frame of sterling silver with platinum overlay. Get away in style this season with this chic J Francis Collection travel bag. Whether you’re headed to the airport or to a friend’s house for a weekend with the girls, this red bag offers plenty of space to store all of your essentials. Tropical print and kimonos will be a huge hit this summer, so it only makes sense that they make the perfect combination. This tropic kimono features vibrant designs and is versatile. You can wear it over a shirt for a splash of color in the office, or you can wear as a swimsuit cover up while you’re at the pool! What item can you not live without this month? Previous post What Colors Look Best On Me?